hat do you do with a case of backpacks? First, consider that a case generally contains only five backpacks. There are plenty of things you can do with backpacks in bulk. It all depends on whether your purchase is for donation or alternative uses. 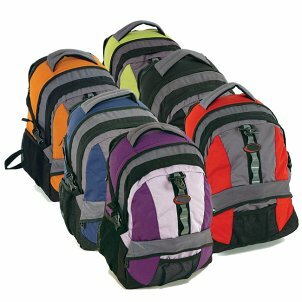 Considering the shape that the economy is currently in, a donation of backpacks to schools would be greatly appreciated. There are many children who have no backpacks to put their supplies in. Imagine going to school without having a place to carry your books or supplies. With decreased educational funding, school budgets are tight enough as it is and leave little to no leeway for extra purchases towards items needed by students. When you consider the job market, many parents are left without the means to purchase school supplies for their children. These children are left to depend on charitable donations of others. A new backpack can mean the world to a child who has none. Geo-caching is a fun outdoor activity, essentially a treasure hunt. The idea is that you plug coordinates into a personal GPS and go searching for the hidden treasure. Often times, the search will lead you into the wilderness, whether that is just outside town or on a true blue nature hunt. Backpacks come in handy to carry some basic essential gear for trips like these, as well as the treasures you find and those you plan to leave behind. Additionally, backpacks in bulk would make a great gift to a geo-caching group or any outdoor enthusiast for that matter. Think hikers, bikers, and campers. Each could use a backpack to store and carry their gear, as well as other essential items. Knitters and other crafters are always looking for a good place to store their supplies and projects. Backpacks in bulk would make a perfect gift for a knitting circle. Any crafter knows that it’s always best to have something more durable than a plastic bag in which to store your project and supplies. Plastic bags can rip. They aren’t very sturdy. Items can easily fall out of the over packed plastic bag. Worse yet, knitting needles or crochet hooks can puncture a plastic bag and become lost. A sturdy backpack with zippers, pouches, and pockets is ideal. Backpacks in bulk are also a great way to organize your home or specific rooms. Cheery, colorful backpacks hanging on wall pegs make a great place to store smaller toys, games stuffed animals, and even dolls in a child’s room. You could take it a step further and utilize the backpacks to organize your garage or shed. They would make a nice place to store all of your tools, including gardening tools or other miscellaneous items. These are just a few of the many possible uses for backpacks. There are many different alternative ways that they can be used. Get your backpacks in bulk and experience them for yourself. In the modern economy, many families are finding it difficult to buy even the most basic of necessities. Backpacks and school supplies are one of the many things which families who are struggling tend to spend less on or skip altogether. Although these supplies are necessary, their high overall cost can cause some parents to make the painful decision to not purchase them. 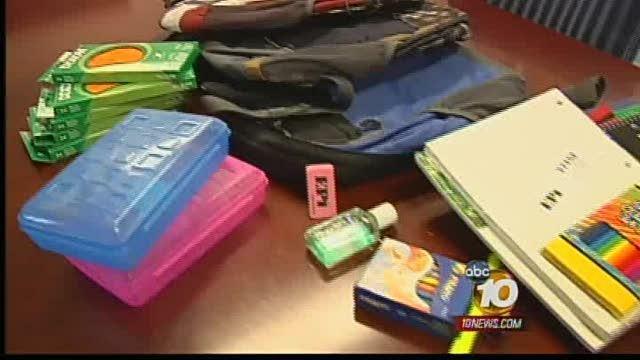 Many communities have created “Backpack Drives” which help alleviate these families from the stress and cost of buying new backpacks and school supplies for their children. Backpacks are filled with the supplies such as; paper, pencils, pens, and other items which are necessary for student success. These backpacks are given without question to families in need. These drives are generally organized by churches, schools and community charity organizations and usually occur in the late summer. Generally the organization conducting the drive relies on the general public to donate the needed supplies. Many times people or businesses will donate funds instead, leaving the organization to buy the supplies themselves. Buying the supplies individually through a traditional retail store may cost the organization more than they can afford or budgeted. This is due to the fact that retailers have created a higher price mark up on individual items to make them profitable. Buying the items separately can drive the cost of a packed backpack to $40.00 or more apiece. Organizations who are organizing these drives should consider purchasing wholesale backpacks and wholesale school supplies from a reputable wholesale retailer. Many wholesale retailers offer both school supplies and backpacks in bulk quantities and for up to half the price of a traditional store. This price savings allow the organization handling the drive to buy more wholesale backpacks and wholesale school supplies. The more wholesale backpacks and wholesale school supplies that are purchased help see that most children are provided for. Ordering from a single wholesale retailer also helps conserve volunteer manpower and makes the process more streamlined. 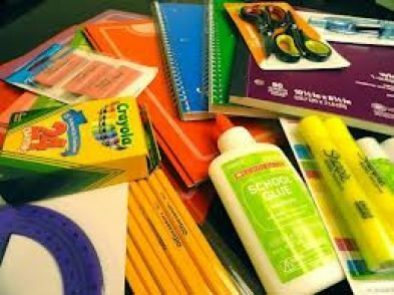 If the organization shopped for school supplies and backpacks in a traditional store, they would need to enlist several volunteers to buy each of the items needed. Then all the supplies would need to be transported to a single location to be separated and packed. This can be a massive undertaking as all these people must be heavily coordinated to ensure no items were missed or duplicate items bought. Using single wholesale retailer guarantees that the correct number of wholesale backpacks and wholesale school supplies will be obtained and they are all delivered to one place. The ordering can be done by one or two people. This simplifies the process and helps avoid any confusion. A wholesale retailer may also be able to provide organizations with pre-packed backpacks for a single price. This makes the process even easier, as much of the work of planning and packing is already done. Groups organizing school supply and back pack drives should utilize the resources available to them in the best way possible. Using a wholesale dollar store to purchase wholesale backpacks and wholesale school supplies helps organizations save money and time and help the most families possible. Formal education plays such as influential role in a person’ life. A child spends most of his or her time at school than at home, which is why it’s been said that a person’s character is shaped in school. For these reasons, it is crucial that the student have everything he or she needs to accomplish school tasks and fulfill school requirements. School equipment like notebooks, pens, and markers are ubiquitous in the classroom, yet schools run out of them at times. At home, the same tools are used by students to work on their homework and school projects, and it is such a drag to run out of supplies as well. When a marker runs out of ink in the middle of an important task, or when you realize that you are fresh out of paper in the middle of a printing job, going to the nearest book store just to replenish school supplies can be really inconvenient and costly. To avoid getting yourself in this kind situation, it is best to have a steady stock of school supplies at your disposal at any given time. The status of the global economy has remained somewhat unstable in the last several years, which has caused the prices of basic commodities to go up and down quite unpredictably. Since school supplies are essential tools both at home and in school, it would be practical to purchase large quantities of these equipment to avoid price fluctuations. The good thing about buying wholesale school supplies is that there is very minimal risk of spoilage because most of these materials are not perishable. Certain items like poster paint and glue do have expiry dates, so be sure to check them first so that you end up buying just the right number of containers. The best times to buy school supplies is during the school break when department stores and book stores are putting up their old stocks on sale to make way for newer supplies. Take advantage of these sales to make bulk purchases of school supplies – it will maximize your savings. Good-quality school bags can be quite costly, but even these things become considerably cheaper during off-season months. Small store owners can benefit a lot from these sales because they can gain profit without hiking the prices of the wholesale backpacks. This way, consumers can still enjoy buying reasonably-priced bags without the inconvenience and stress that goes with shopping at huge stores. The main advantage of buying in bulk is the lower unit price of the items you buy. Naturally, the initial cost will be bigger but the total savings and long-term convenience outweighs it. Schools and parents should involve the children in buying wholesale school supplies to make sure that they are choosing good-quality materials that the students will enjoy using. Some people are skeptical about buying discounted items for fear that they are of poor quality, but this is a sore misconception. Shopping wisely for school supplies entails checking for good and reputable brands and having a list of the materials that are consumed the fastest. Online suppliers can be just as reliable as those found on the high street, and they often deliver bulk purchases free of charge.